After a flurry of misguided adventures that failed to meet their mark, it’s finally here; a 3D Sonic title that sees the popular blue hedgehog return to form. Whisking Sonic and trusty pal Tails ‘Miles’ Prower into space, we find our intrepid duo checking out the sights and sounds of Dr. Eggman’s Incredible Interstellar Amusement Park. On their travels, the pair bumps into Yacker, who hails from a species of aliens known as Wisps, and it is from their new extraterrestrial friend that they begin to unravel Dr. Eggman’s true evil intentions. Having captured hordes of Wisps, Sonic’s bitter rival aims to convert them into Nega-Wisps from which he’ll utilise their power as fuel for a mind control beam that he intends to use on the planet below. It, therefore, falls to our blue hero to save the day once more, visiting each planet within the amusement park where he must destroy each of the generators and freeing the Wisps from captivity in the process. The game supports three different control schemes; Wii Remote and Nunchuk, Classic Controller and the Gamecube Controller, with the latter two seeming most suitable. Each offers more responsive control over Sonic as speeds his way through each level, retaining core moves such as his Homing Attack, Wall Jumping, Sliding and Drifting around corners. Gameplay sees a mix of ‘Speed’ sections that’ll see you run and grind your way along a colourful blend of 3D environments, whereas Sonic Team has seen fit to add in levels in which the camera retains a more 2D affair, allowing for more platform-based action to ensue. 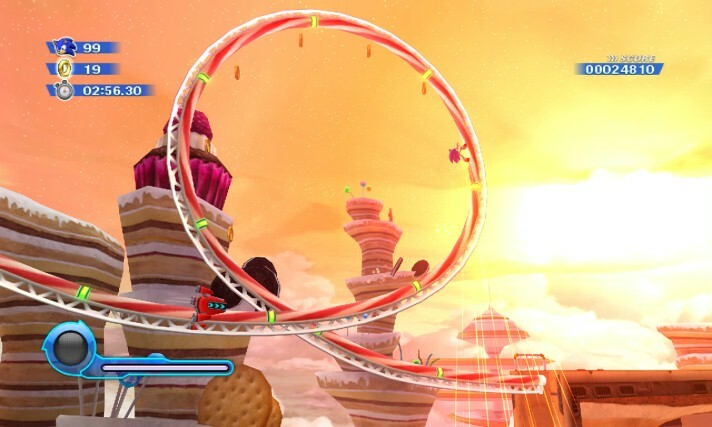 Whilst the more recent outings in the Sonic universe have been heavily criticised for their use of mechanics deemed to be more of a gimmick rather than necessary innovation – the Werehog powers in Unleashed remaining to be a particularly distressing choice for many fans – Sonic Team have seen fit to introduce a further mechanic in the form of ‘Colour Powers,’ granted to Sonic by the Wisps themselves. With an array of coloured Wisps on offer, each serving to provide a continual variety in gameplay, Sonic will progressively encounter White, Cyan, Yellow, Blue, Orange, Green, Pink and Purple forms being held in capsules. 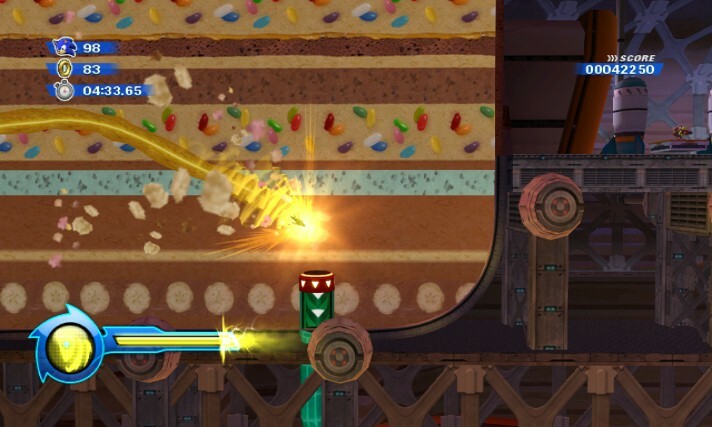 Each empowers Sonic with a distinctly differing ability, with the standard White Wisps, for example, allowing Sonic to boost his speed, whereas those found towards the tail end of the game become far more adventurous in style with the Purple Wisp transforming our hero into a ‘Purple Frenzy’ – empowering Sonic to be able to eat all enemies and obstacles within his path. It is perhaps easiest to relate inspiration for such a diversifying array of power-ups to that seen within outings by Nintendo’s plumbing counterpart Mario, most notably with that seen within Super Mario Galaxy 2. Unfortunately, the Wisp Colour Powers aren’t quite as well implemented. Whilst a number truly enhance the gameplay, most noticeably the Drill power that allows you to freely burrow through soft ground, a few could have been removed from the mix. The Green Wisp ‘Hover’ power, although cool when utilised to speed along multiple strings of Gold Rings, seems entirely pointless when attempted to be used for any other benefit. Whereas the Laser, for which the player must determine the path in which you travel, doesn’t provide you with enough time to ensure you zip off in the direction that you really wanted to. It is a disappointment, yet a little more originality with the Colour Powers would’ve been welcome. It, therefore, becomes an enormous disappointment that the entire gameplay experience is soon evidently marred by continual inconsistencies. Camera transitions between 2D and 3D environments are, in places, a little too slow in keeping up with Sonic’s continually speedy pace leading to frequent cheap deaths, and some of the spectacular set-piece moments are clouded by an overwhelming amount of on-screen action. Whilst the latter is no doubt an important addition to the visual spectacle of Sonic Colours, it also contributes to the plentiful occurrences in which your frustration levels will undoubtedly soar as you sit, controller in hand, helplessly unable to steer Sonic away from enemy attacks and hazards that you cannot see. Also failing to really captivate any sense of imagination from the developer are the boss battles, which range from the irrepressibly cool to the downright dull. That said, there are a few highlights yet it’s nothing that you haven’t seen before. The predictable design means that there is never as much of a challenge on offer as you’d expect, and as soon as you determine the attack pattern such battles can be over before you even feel like they’ve got going. An opportunity missed, for sure. 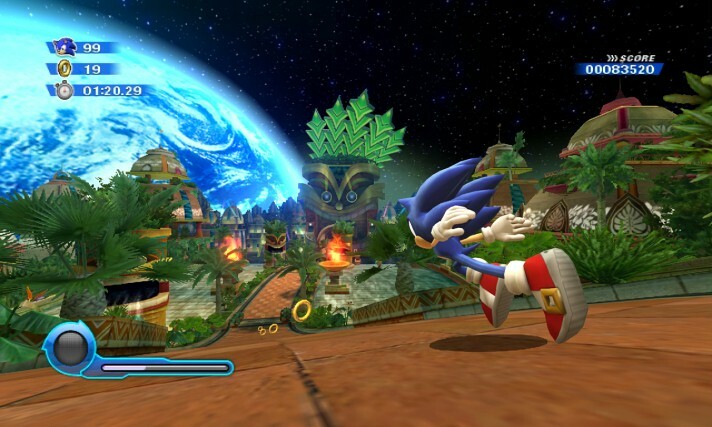 Multiplayer is also offered in Eggman’s Sonic Simulator, where two players may co-operate across a series of virtual reality inspired stages. There are a number of credible ideas here, but yet again its implementation leads to too much inconsistency. The ability to combine each other’s Colour Powers is perhaps the most enjoyable aspect, yet the most detrimental facet is that there is no split-camera when either player races ahead of the other leaving the other trailing off-screen. Such issues hamper the freedom in gameplay, with each player having to continually aid each other rather than play with their own independence. Despite such negligible issues, the evidence is clear; this is Sonic’s best outing in quite some time, although regrettably, that isn’t so hard to achieve in comparison to that which has come before it. Whilst the Sonic series fumbles in trying to find a foothold in the 3D realm, SEGA promised that they were aiming to return the favourable blue hedgehog to form and Sonic Colours is easily the first step in a potential resurgence. Whilst inconsistencies detract from the overall experience, there is still plenty to enjoy here that’ll keep you coming back for more. We just hope that the next title from Sonic Team will continue to perfect the recipe rather than introduce unfavourable ingredients. Regardless, the future is certainly bright, and blue, for SEGA once more.